Without any hesitation, I knew I will be attending the Greenapple Ballet Charity Concert when I read about it in The Star. Went to watch it with Shu-Min at Dewan Sri Pinang last Saturday. Watching the concert really brought back those memories. 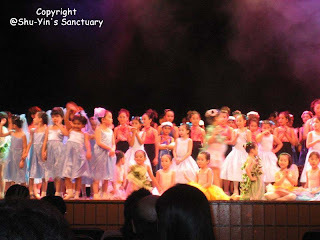 I still remember how much I enjoyed dancing ballet as a little girl. Started learning since I was 7 and stopped after I finished Grade 8 at age 17. 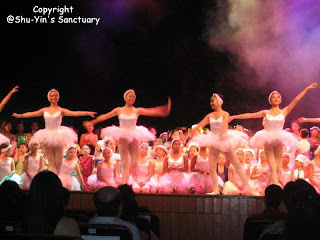 I can also still remember myself wearing a red tutu (dancing as a rose) in the music Waltz of the Flowers by Tchaikovsky during Greenapple 10 years Anniversary Concert so many years ago. I was in Grade 5 then. 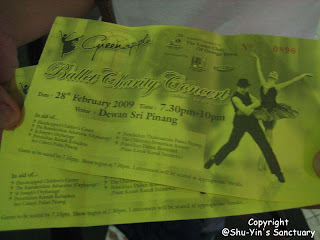 Lovely memories..
Our RM30 free seating tickets. The dancers/ballerinas, some as young as three. Some are in their teens and some are young adults. It was a marvelous performance. Besides ballet, there were also a mixture of modern, tap, jazz and belly dances. The theme was 'By the Children, For the Children'. They were dancing to music of High School Musical, A Spoonful of Sugar, I Have No Strings, Swan Lake, Happy Working Song, Pink Panther and Mamma Mia! and etc. It was a mesmerizing and entertaining 2 hours of dance and music! p/s - We were actually not allowed to take pictures. So these stolen taken pictures are a bit blur!